An article I wrote about the pro’s and con’s of Jeep Wrangler Unlimiteds always been a popular one. But if you’re in the market for a new or used Jeep, then you may be interested in just a quick run-down of the top reasons to buy a Jeep Wrangler Unlimited — instead of all that detail. The Jeep Wrangler Unlimited (TJ) was introduced late in the 2004 model year in a Sport trim. 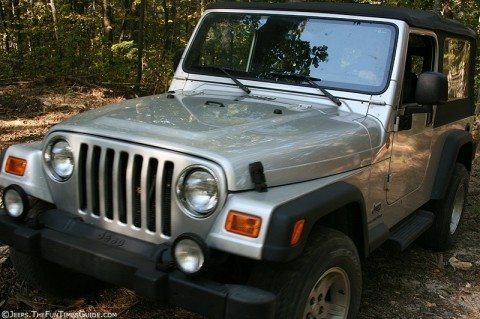 Jeep added the Rubicon trim to the Unlimited model in 2005. And finally, the 4-door model with a longer wheelbase (JK) made its debut in 2007. The Unlimited has the same overall width and height as the short-wheelbase Wrangler; the difference comes in the length. Fifteen inches have been added to the overall length of the Unlimited, making it more versatile than the standard, short-wheelbase Jeep Wrangler. #2 – More cargo space. With 13 more inches of floor space behind the rear seat, the Unlimited has DOUBLE the amount of cargo capacity than the short-wheelbase Wrangler. Twice as much space to store your stuff means you can take twice as much gear with you on your drive — whether you’re headed down the highway or off-the-beaten path. Rear-seat legroom has also increased from 35 to 36.7 inches, providing more leg and knee room for passengers. Also, because of the longer wheelbase, the hard top now provides more headroom to rear-seat passengers (41.1 inches compared to 39.5 inches in the short-wheelbase model). #4 – Ride quality & handling. Like all Wranglers, the Unlimited is “Trail Rated” which means that it is capable of handling “any obstacle you’re likely to encounter.” Plus, the Unlimited maintains a 20-degree breakover angle, which Jeep says is the minimum for serious offroading. Add to that, the fact that Unlimited models include a Quadra-Coil suspension, a Command-Trac four-wheel drive transfer case, Trac-Lok limited-slip rear differential, 15-inch aluminum wheels with 30-inch Goodyear Wrangler GSA tires, and high-pressure gas shocks as standard equipment. The Unlimited also features a Dana 30 front axle and heavy-duty Dana 44 solid rear axle, which helps to maintain contact with whatever terrain you might tackle. The Unlimited offers more refined, on-road comfort and quietness due to its longer 103-inch wheelbase. It’s 10 inches longer than the short-wheelbase Jeep Wrangler; the additional 5 inches behind the rear wheels enhances on-road comfort and off-road capability. According to Jeep, the addition of more carpeting in the cargo area, better dashboard padding, and sound dampening under the hood, the Unlimited is also 30% quieter than the original Wrangler. Air conditioning, an AM/FM stereo with CD, easy access front seats, fold and tumble rear seats, power steering, 2 hooks, and fog lamps are all standard equipment on the Unlimited.Likewise, both hard-top and soft-top versions of the Wrangler Unlimited are offered. The hard top option comes with larger, deep-tinted rear windows, as well as rear defroster and rear window wiper and washer. The Sunrider soft top option includes a sun roof feature in addition to the full top-down ability. By folding the soft top back completely over driver and front passenger, you create a 45×23-inch sun roof opening that is larger than your typical glass sun roof. The Unlimited comes with “next-generation” dual frontal airbags, front disc and rear drum brakes, 3-point seatbelts in all positions, and child seat tether anchors. The Wrangler Unlimited has a towing capability of 3,500 lbs., which is 1,500 lbs. more than the standard Wrangler. #9 – In a class of its own. It has no real competitors. No other vehicle can match the open-air ride of the Jeep Wrangler Unlimited, giving you the excitement of driving with the top down, doors off, and the windshield down on the trails or on the highway. In a Jeep Wrangler Unlimited model, you are one with the outdoors, in a way that no other vehicle can deliver. #10 – Parts and accessories. Perhaps the best news for Jeep Unlimited owners: most parts and accessories made for 1997-2005 Jeep Wranglers also fit the 2004-2005 Jeep Wrangler Unlimited model. In sum, the Jeep Wrangler Unlimited model takes extreme off-roading to a whole new level. It’s the perfect vehicle for serious off-roaders AND everyday drivers who seek an open-air ride with adequate cargo and passenger space, as well.